Linear Actuators for Satellite Dish Antenna Applications - Venture Mfg Co. The dish antenna use linear actuators for their smooth functioning. These antenna are responsible for various critical satellite applications, and so the actuators used in them should be of high quality. Venture Mfg. Co. is one of the leading and well-known manufacturers of actuators for satellite dish antenna in the USA. 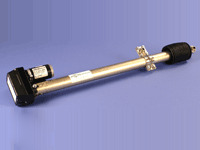 We have a reputation of manufacturing high-quality and durable linear actuators for several years. Components such as telescopic guides and linear rails form the important parts of a train. However, not to forget, actuators are also important for proper operations of different functions of a train. Safe for Use: The linear actuators that we manufacture and provide have an adjustable limit reed switch protection. This feature makes this product safe for use. Anti-Rust Coating: Another striking beneficial feature of these satellite actuators is that they have an anti-rust epoxy coated steel construction, and a high-grade plated hardware. This makes them extremely durable and capable of withstanding harsh operating conditions. Quiet Operation: These linear actuators that are used in dish antenna work smoothly and do not make any noise during their operation. Long Life: Our expertise and knowledge helps us manufacture the linear actuators that are capable to serve their purpose for a long duration. Single Screw Limit Switch Adjustment: The satellite actuators for dish antenna that we provide feature a single screw limit switch adjustment. Freeze Vent Protection Holes: The linear actuators feature holes for the purpose of freeze vent protection. Precise Accuracy Positioning: Be it KU band or C band, the actuators for satellite dish antenna facilitate a precise accuracy positioning. Waterproof Shaft Seals: These devices have two shaft seals and three drain holes. This provides excellent waterproofing to these actuators. Plastic Impregnated: These devices are plastic impregnated. This makes them easy to replace and eliminate all the potential risks during installation. Sealed Hermetically: The satellite dish antenna actuators are hermetically sealed in a clean atmosphere. This helps in eliminating all the possible ill effects of corrosion, dust, as well as oxidation. Advanced Design: All the satellite actuators for dish antenna that we manufacture have advanced design. This evades all the possibilities of sticking, binding or wearing of hinged joints. Do you want to know more about these actuators? We can help you get your customized actuator for satellite antenna .